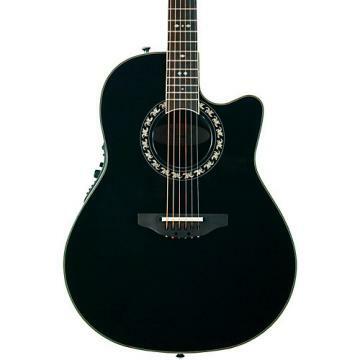 The new Ovation Elite Plus is lighter, louder, richer and fuller – everything you’ve wanted an acoustic guitar to be. Featuring a premium soundboard made from hand-selected exotic woods with LX scalloped bracing, the Elite Plus responds evenly from the lightest touch to hard grinding power chords. 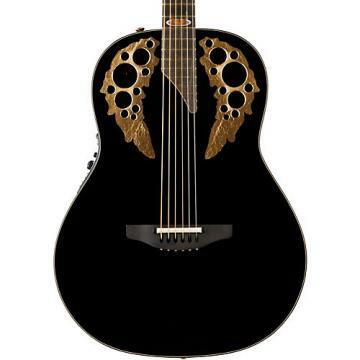 Ovation’s pioneering multi-soundhole design enhances string vibration and sustain by improving soundboard efficiency. A cutaway offers full access to the gloss-finished, 5-piece mahogany/maple neck. A Contour composite body maximizes acoustic output and is ergonomically designed for comfort in any playing position. This guitar also boasts hand-inlaid abalone appointments, a deluxe grade ebony fretboard and bridge, and upper-bout soundholes decorated with exotic hardwoods. With its onboard compressor, the OP-Pro Studio preamp enhances strummed chords, fingerpicked arpeggios, and single-note solos. Connect the Elite Plus to virtually any sound system, stage amp, or recording console, and experience the rich tonal quality of the Elite plus. Includes hardshell case. This is first ovation I have owned and I'm happily impressed! I have 8 other guitars of varying prices and build quality, but this is my new favorite! Glad I took the chance to check it out!